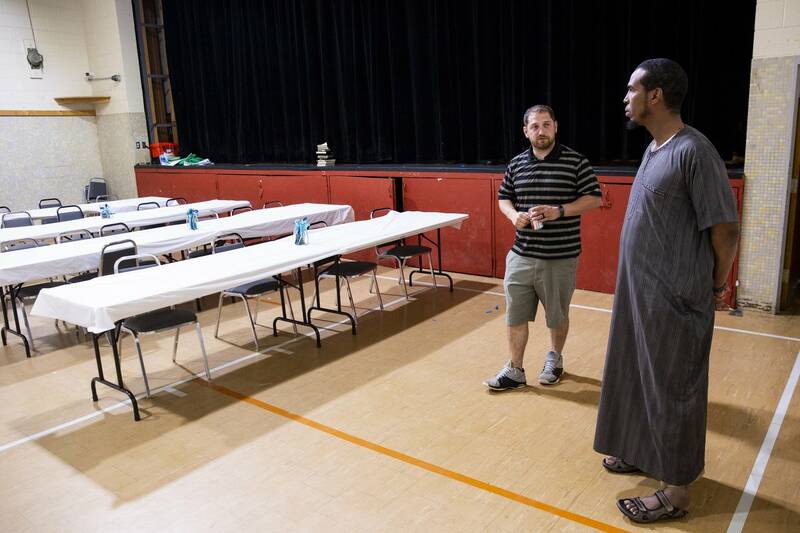 The idea for a smattering of Republican activists to hold their annual convention at Dar al-Farooq, a Twin Cities mosque, started with two guys simply talking to each other. Abdulahi Farah and Zavier Bicott are both in their 30s. They met through a civic initiative called One Bloomington; both live in the Minneapolis suburb. Bicott, who chairs the Republican Liberty Caucus of Minnesota, told Farah he would love for his group to have an event at the mosque. And Farah, who runs programs at al-Farooq, was game. "I said, 'As a neighbor, definitely. This is one of the amenities. You guys are more than welcome to use here,'" Farah said. "And that's how the idea came up." Sensible as the idea seemed to them, it set off a firestorm of controversy within the party, particularly on social media. One woman commented on Facebook that it was "pure stupidity." Another said it was "disgusting" and was enabling those who want to destroy the country. Bicott and Farah acknowledged a virulent strain of anti-Muslim rhetoric within the Republican Party, but Bicott said he's gotten more support than criticism for the decision. 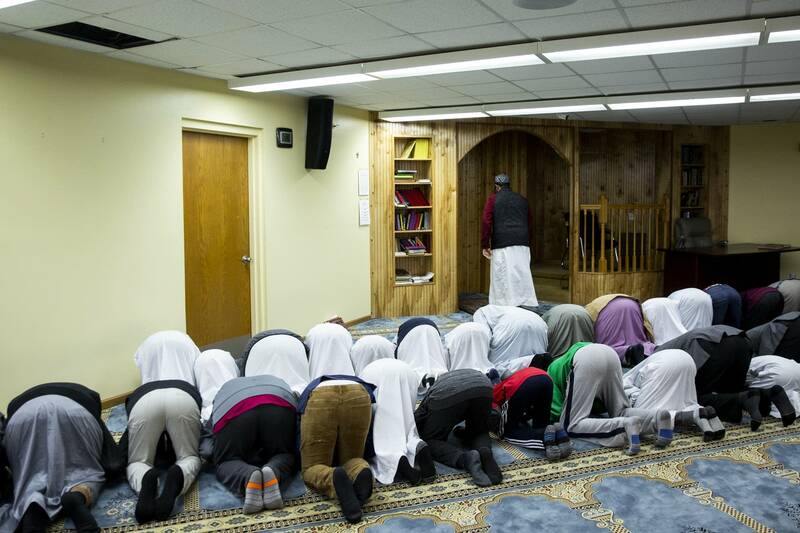 This is the same mosque where members of a white militia from rural Illinois allegedly set off a bomb last summer. As horrific as that event was, the mosque was overwhelmed with community kindness. But Farah, a DFLer, asked Bicott: Why weren't there more Republican officials coming out to support the mosque? "You see Democratic Party leaders coming with smiles, flowers, and you have GOP leaders, on the other end, that have this rhetoric, all the way to the current president," Farah said. Bicott didn't vote for President Trump. But he said he's familiar with the anti-Muslim views of some of his fellow Republicans. They fear that Muslims in America will try to overtake the Constitution with their set of religious principles, known as sharia, he said. "And I just say, 'I'm a libertarian, I am pretty liberty-minded. I would be there to defend the Constitution with you if something like that happened,'" Bicott said. "But they're like, 'It's coming, inch by inch!' I just agree to disagree with them." The mosque's executive director, Mohamed Omar, said it's great that he can have genuine conversations about his religion with Bicott. He said divisiveness is in vogue in this country. "All this discussion is coming from what I call a 'hate potluck' — people who always come together and say, 'Hey, what hate do you have?' 'I have some hate for Jewish,' 'I have some hate for Muslims,'" he said. "If you keep saying, 'I don't hate anybody,' then you're [seen as] naive, you don't know what you're talking about." Only 13 percent of Muslims identify with or lean toward the Republican Party, according to the Pew Research Center. That's compared to 66 percent who favor Democrats. The symbolism of Bicott's decision to hold the convention at Dar al-Farooq was not lost on 24-year-old Abdi Mohamed of Woodbury. The young Somali-American, a Republican himself, will attend his first state GOP convention next month. 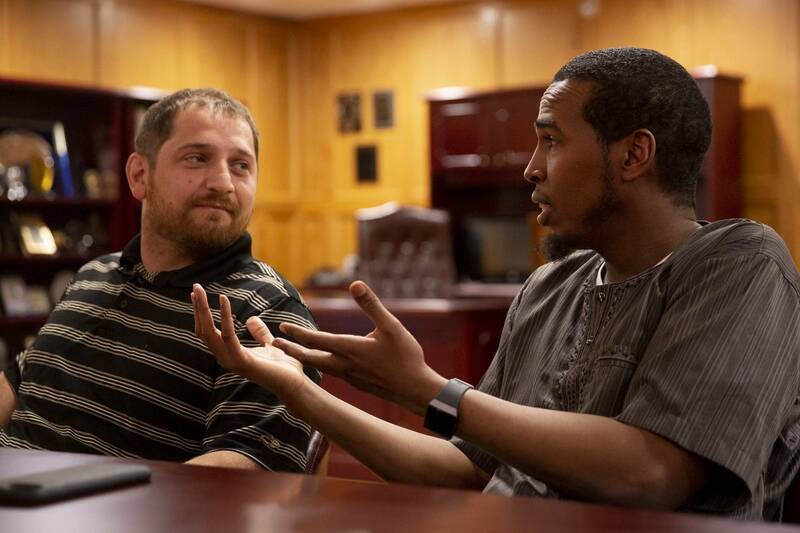 "It's a way of reaching out to Muslims who are culturally conservative and can benefit from conservative policies," said Mohamed, who has gone on conservative podcasts to debate anti-Muslim voices within the Republican Party, including gubernatorial candidate Phillip Parrish. "Zavier and many others want to expand the conservative and libertarian message to all." Two Republican Minnesota lawmakers, Reps. Cindy Pugh of Chanhassen and Kathy Lohmer of Stillwater, drew headlines after posting inflammatory language about American Muslims on Facebook. House DFL Leader Melissa Hortman, Brooklyn Park, has called for a public apology and training in religious tolerance. Asked to comment on the controversy surrounding Saturday's meeting, Jennifer Carhanan, chair of the Minnesota GOP, said her party "is an open, inclusive and optimistic party" with "no religious test to participate." "We promote and encourage diversity of thought and respectful debate around issues," she said. "Our party prides itself on being a 'big tent' party, and while not all can agree on 100 percent of issues, it's our shared common approach toward protecting the American dream that unites us all." Bicott said that no matter who's in office, his pitch to Muslim Minnesotans is about principles. He thinks the GOP is a good fit for them because of its conservative values and push for limited government. He said Republicans need to reach out to other communities, or else the party will die. "I just happen to be the one doing it with al-Farooq," he said. "If we don't continue to do outreach and share our values and find common place and start having conversations that need to happen, then we're not going to be successful as a party."